Discussing politics and various proposed legislations is somewhat anathema to me for a variety of reasons but predominately because most people cannot draw distinctions between an argument and a debate. I love to debate and hate to argue. Arguments almost always deteriorate to name calling and one side taking their ball and going home. This post will be a rare exception, and I will not debate an opinion, only present facts as I know to be true. You can judge their value. Law makers in the state of Indiana are currently considering passing a bill that would specifically allow people the right to resist law enforcement officers who are trying to enter their home illegally. Hell yeah, my home is my castle, down with dirty cops right? That is what most people think when they hear about this bill. Seems simple doesn’t it? Unfortunately it isn’t. As you can imagine this is a hot topic around roll call rooms in police departments around the state. Now I can hear many of you saying, “Of course he is going to be against it. He’s a cop.” Well yes I am a police officer and I am against this piece of legislation but why? On Thursday last week a fellow detective of mine, Grant Melton, posted on Facebook a letter he wrote to all of our Indiana legislators. Grant is a ten year veteran of the Indianapolis police department, and he very adroitly outlines the reasons this law, as it is written, is a bad idea. Read it and see what you think. I am a Police Officer with the Indianapolis Metropolitan Police Department, where I have served the Citizens of Indianapolis for 10 years. I am writing to you regarding Senate Bill 1, the proposed “Right to Resist” legislation currently pending in the Senate. I am writing to request you vote NO on passing this legislation. I firmly believe this is a flawed public policy, based largely on misunderstandings of the “Barnes” decision handed down by the State Supreme Court. 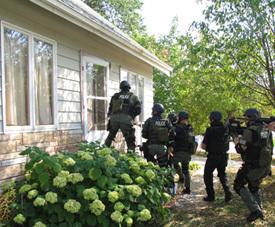 The Indiana and United States Supreme Courts have for years held that Police Officers may legally enter homes with a warrant, or when exigent circumstances exist. These exigent circumstances include, but are not limited to: in pursuit of a fleeing person, when the officer believes a life may be in danger, and when the Officer believes the destruction of evidence is occurring. All of these exigent circumstances depend on the Officer’s assessment of the facts known to him at the time of the entry. Unfortunately, we live in a society in which many Citizens get their news and form opinions based solely on headlines, without actually researching the facts. In the fallout after the “Barnes” case, it was clear that many of the Citizens asking for you to pass new legislation had not actually read the Court’s opinion in that case. There is a misperception that the Supreme Court had made it to where Officers could enter the home of anyone, at any time, without repercussion. This is simply not true. Unfortunately, when people hear “illegal or unlawful entry”, they have automatically assumed the worst, meaning they imagine Officer’s kicking in doors without cause, assaulting the residents, and not being held accountable. Again, this is not the case here. The term “unlawful search” or “unlawful entry” more often involves a situation that is not so black and white. For example, in the last 10 years, while many have attempted to claim that I conducted an unlawful search or entry, to my knowledge, a court has only ruled in their favor one time. This incident did not involve a residence, but a business. I was approached by a citizen who said he had observed a large amount of marijuana in the open inside of a restaurant/bar. I went to the restaurant/bar and noticed the sign indicated the business was open. The door was also open. I entered what appeared to be an open business, as any Citizen or customer could have, and came into contact with several persons smoking marijuana, and in possession of several pounds of marijuana. The court later ruled that this was an “unlawful search” and that I should have gotten a warrant, even though anyone could have walked into the open business. Should the persons inside that bar have been able to use force against me, if it was determined that it was an unlawful search or entry? In my 10 years as an Officer, I have legally entered thousands of homes, many times with a warrant, but also often when exigent circumstances exist. A common thread with these entries is, while I was legally entering the home, the residents often claimed I had no right to be in their home, even when I had a warrant in hand. Ask any Police Officer and they will tell you this is their experience as well. While I and many of the Officers I know support a Citizen’s right to defend themselves in their own home, I believe this legislation will result in far more injuries, if not deaths, to Police Officers and Citizens. The reality of the world we live in is that Police Officers have to deal with a criminal element of our society that truly does not understand every nuance of the laws you write. The same can be said for law-abiding Citizens as well. One need only read public comments on any news organization website relating to this legislation, or listen to comments made in your public hearings to understand this. Time and again you will see Citizens saying they will shoot any Officer entering their home without a warrant. Any Police Officer or legal expert will tell you a warrant isn’t always required, but many Citizens, because they don’t know any better, believe a warrant is required. This fact alone should give you pause in considering this legislation. If average Citizens don’t even understand that a warrant isn’t always required, how can you expect them, in a matter of seconds, to decide if an Officer is making lawful entry, and then decide whether to use potentially deadly force against that Officer? Please consider this for a moment. Every day, all across Indiana and our great country, Police Officers respond to incidents that are often contentious. While investigating that incident, an Officer gathers information, and most of the time only has seconds to decide a course of action. Many times, this decision involves the use of force, or entry into a residence because the facts known to him at the time lead the Officer to believe that is his proper course of action. Police Officers are trained in the use of force, as well as in search and seizure issues. Unfortunately, even with this training, Police Officers sometimes make the wrong decision. Sometimes what may appear to be one thing to an Officer may not turn out to be what it seems. We have a system in place for deciding whether an Officer lawfully entered, and that system is the courts. As you know, there are several layers of judicial review. Often, cases will go to the Supreme Court, as the “Barnes” decision did, before a decision is made of whether an Officer made lawful entry. This involves countless hours of legal research and argument by skilled attorneys. With this legislation, you are essentially giving the Citizens the ability to pass judgment in seconds when that decision takes months, even years in our appellate courts. Only long after the potentially deadly situation has passed will a Court of law pass judgment on the lawfulness of the entry, or the lawfulness of the use of force. For comparison sake, compare this to the past two legislative sessions. Clearly, the “right to work” legislation is the most contentious issue facing you. Regardless of what side you are on, I think all would agree this is an important decision for the Citizens, and is not to be taken lightly. For 2 sessions now, the Citizens of Indiana have sat back and watched as one party has held countless meetings discussing the issue, researched the case law surrounding it, and held public hearings. This has been done because this legislation affects the livelihoods of Hoosiers, and you want to get it right. A Police Officer only wishes he had the luxury of public hearings, meetings to discuss the calls we respond to, and having lawyers on hand to research case law while deciding whether to enter a home. The fact is, this is simply not possible, and the decisions made by our Police Officers certainly affect the lives of thousands of Hoosiers every day. When I say they affect their lives, I am not speaking of financial health or benefits, I am speaking of the actual ability to live. These decisions are often life or death decisions, and this pending legislation will now create the possibility that more decisions mean the difference between life and death. Only now those decisions will be carried out by the Police and the Citizen with whom they are interacting. I’ve mentioned several times that the judgment of whether an entry was lawful or not is based on the articulable facts known to the Police Officer at the time entry was made. The person inside the home does not know what the Officer knows or has seen. To expect a person inside the home to make the decision of whether the Officer is lawfully in the home is a dangerous path to take. Officers are trained to respond to force by going one step above the force being used by the person resisting. When a person believes they are lawfully resisting, they are sure to escalate their resistance, possibly resulting in the death of either the Officer or the Citizen. I’m sure many of you would argue that the exceptions you have included in this law would prevent this from happening. I again ask you to consider the legal knowledge of the general public. If Citizens are confused about whether Police can only enter without a warrant, how do you expect them to be knowledgeable about the exceptions to this law, and under what circumstances they can legally resist? As I said earlier, people get their education from headlines and word of mouth. If this law passes, Citizens will think they can fight the police if the Police don’t have a warrant. I was hearing this after the committee meeting, when the law hadn’t even been passed yet. Also, again please consider that many of the criminals we encounter do not believe we have a right or authority to do many of the things we are lawfully allowed to do. Won’t these persons then claim we were not engaged in the execution of our duties? This is one of the exceptions you have placed in this law. Sure, it will later be decided that the Police acted appropriately, but this will be long after the use of force that likely would have resulted in injury to the Officer or Citizen. Hopefully you don’t force us to “just wait and see”. Finally, if I legally enter a residence and am encountered by an armed resident pointing a gun at me, do you expect me to engage in a conversation with them and explain all of the reasons I have probable cause to be there so the resident can make an informed decision as to whether he has a “right to resist”? I certainly hope you answer no to this question. This kind of situation is all but guaranteed to end with a shooting of either the Officer or the Citizen. If the Citizen shoots and kills the Officer, how are we even going to know what the Officer knew prior to entering the residence so that we may judge whether it was a lawful entry? If you question any of the claims I make in this letter, please feel free to contact me and I will do my best to elaborate. I’d also like to extend an offer for any of you to take a ride along with a member of the Indianapolis Metropolitan Police Department so you can experience first-hand what we deal with, and the decisions we are forced to make on a daily basis. I sincerely hope you will talk to any Police Officer about their feelings on this legislation before voting, and that you choose to vote against this. Thank you for your time and consideration, and thank you for your service to the State of Indiana. The most important argument Grant makes is that barring some rare circumstance (I say rare because no matter how many dirty cop movies you see 99.9% of American police officers are honorable men and woman) it is impossible for a citizen to know if the officer entering his home is doing so illegally or not. One point that is absent is the fact that courts often issue what are called No Knock Search Warrants. These are warrants issued to the police when they have probable cause to believe that someone may be armed and violent or that evidence may be destroyed if entry is not made quickly. These types of warrants typically are used when narcotics are involved. How are citizens supposed to know that this type of warrant is in effect? They can’t. I hope that law makers can see past what sounds like a good idea and think of the consequences a bill like this will have on the safety of Indiana citizens. Our laws already protect us from unlawful search an seizure. Why give people the idea that violence is the right way to respond instead of using the courts to right wrongs?